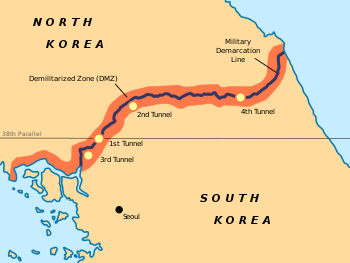 The Military Demarcation Line within the Korean Demilitarized Zone. The Military Demarcation Line (MDL), sometimes referred to as the Armistice Line, is the land border or demarcation line between North Korea and South Korea. On either side of the line is the Korean Demilitarized Zone (DMZ). The MDL and DMZ were established by the Armistice at the end of the Korean War in 1953. In the Yellow Sea, the two Koreas are divided by a de facto maritime "military demarcation line" and maritime boundary called the Northern Limit Line (NLL) drawn by the United Nations Command in 1953. The NLL is not described by the Korean Armistice Agreement. Locals and foreigners will be allowed to cross the line at the Joint Security Area once this area is cleared. 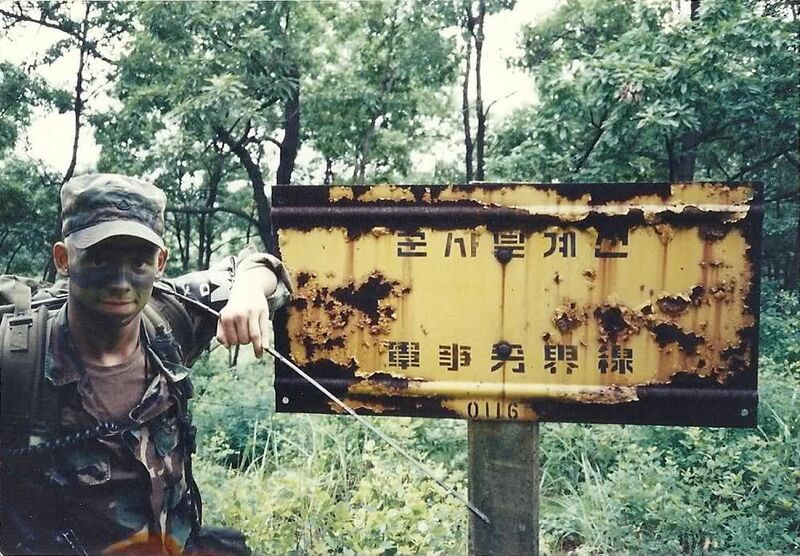 MDL sign in Joint Security Area, 1956. Bridge MDL sign in context. The DMZ runs near the 38th parallel, covering roughly 248 kilometers (154 mi). American and South Korean soldiers patrol this line along the South Korean side while North Korean soldiers patrol along the North Korean side. In Korean, the line is called the Hyujeonseon (휴전선), meaning "armistice line." It is also sometimes called the Gunsa Bungye-seon (군사분계선), which literally means "military demarcation line." However, in colloquial usage, the dividing line is more often called the Sampalseon (삼팔선, "38th parallel"), a name likely coined at the end of World War II, when it would have been an accurate description of the North-South border. The line itself is marked off by a series of 1,292 identical signs which are placed at intervals across the peninsula. The north facing side of the signs are written in Korean and Chinese, and in Korean and English on the south facing side. The signs are now aging and rusting. There have been frequent skirmishes along the line since the armistice ended the fighting of the Korean War. Although the Korean Armistice Agreement specifies where the demarcation line and demilitarized zone are located on land, the agreement does not mention lines or zones in adjacent ocean waters. Shortly after the signing of the Armistice, a line in the sea was drawn unilaterally by the United Nations Command (UNC). This Northern Limit Line or North Limit Line (NLL) represented the northern limit of the area in which South Korea permits its vessels to navigate, not a demarcation line on which the two Koreas agreed. The Korean Armistice Agreement (KAA) provisions regarding the MDL and DMZ do not extend into the Yellow Sea or Sea of Japan. In 1999, North Korea unilaterally asserted its own "North Korean Military Demarcation Line in the West Sea (Yellow Sea)", also called the "Inter-Korean MDL in the Yellow Sea". Nonetheless, the UNC-drawn line functions as a de facto or "practical" extension of the 1953 MDL, despite occasional incursions and clashes. The Civilian Control Zone (CCZ) is a zone that restricts civilian access to military operations and military facilities near the Demilitarized Zone for the purpose of protection and security. The zone began in February 1954, when the US 8th Army started to regulate cultivation by civilians for the purpose of security of military facilities. In the civilian access control area, land use for civilian farming is permitted to the extent that there is no obstacle to military operations and security, but the freedom of the people and basic rights such as the exercise of land ownership except the cultivation right. On October 16, 2018, the governments of North and South Korea agreed to allow locals and tourists to cross the Military Demarcation Line's infamous Joint Security Area location once it is cleared of personnel. The crossings will resemble the brief moment South Korean President Moon Jae-In stepped into North Korea with North Korean President Kim Jung-Un on April 27, 2018. After the Joint Security Area was cleared of armed military personnel on October 25, 2018, it was announced that tourism at the MDL crossing would be delayed. On November 1, 2018, officials from the South Korean Ministry of Defense confirmed that buffer zones were established across the DMZ by the North and South Korean militaries to ensure that both militaries would keep their distance from the Military Demarcation Line (MDL). In compliance with the Comprehensive Military Agreement which was signed at the September 2018 inter-Korean summit, the buffer zones help ensure that both Koreas will ban hostility on land, air and sea. The buffer zones stretch from the north of Deokjeok Island to the south of Cho Island in the West Sea and the north of Sokcho city and south of Tongchon County in the East (Yellow) Sea. Both North and South Korea are prohibited from conducting live-fire artillery drills and regiment-level field maneuvering exercises or those by bigger units within 5 kilometers of the MDL. No-fly zones have also been established along the DMZ to ban the operation of drones, helicopters and other aircraft over an area up to 40 km away from the MDL. For UAVs, the no-fly zone is 15km from the MDL in the East and 10km from the MDL in the West. For hot-air balloons, the zone is within 25km from the MDL. For fixed-wing aircraft, no fly zones are designated within 40km from the MDL in the East (between MDL Markers No. 0646 and 1292) and within 20km of the MDL in the West (between MDL Markers No. 0001 and 0646). For rotary-wing aircraft, the no fly zones are designated within 10km of the MDL. Both Koreas also established "peace zones" in the area of the Yellow Sea which borders the MDL as well. On November 22, 2018, North and South Korea completed construction to connect a three kilometer road along the DMZ. The road, which travels across the MDL, has 1.7 km in South Korea and 1.3 km in North Korea. The road was reconnected for the first time in 14 years in an effort to assist with a process at the DMZ's Arrowhead Hill involving the removal of landmines and exhumation of Korean War remains. On November 30, 2018, following the removal of the "frontline" guard posts and Arrowhead Hill landmines, railroad transportation between North and South Korea which ceased in November 2008 resumed when a South Korean train crossed the MDL into North Korea. On December 8, 2018, a South Korean bus crossed the MDL into North Korea. On December 12, 2018, Militaries from both Koreas crossed the MDL into the opposition countries for the first time in history to inspect verify the removal of "frontline" guard posts. ^ The MDL was defined and established in the Korean Armistice Agreement (KAA), Article I, paragraphs 1–11. The KAA includes provisions regarding the MDL and DMZ; but those provisions do not extend into the Yellow Sea or the Sea of Japan. The subsequently devised Northern Boundary Line or NLL Archived 2012-03-11 at the Wayback Machine was neither initially conceived as part of the MDL, nor have the DPRK and UNC agreed to any subsequent extension of the MDL beyond the agreed upon limits of 1953/7/27. ^ Ryoo, Moo Bong. (2009). "The Korean Armistice and the Islands," p. 5. Strategy research project at the U.S. Army War College; excerpt, "Strategic Consequences of the Agreement. The agreement to retain the five islands under UNC control has shaped many aspects of the security environment of the Korean Peninsula. The most obvious and prominent consequence is the establishment of the Northern Limit Line (NLL). The NLL has served as a practical maritime borderline and an effective means to separate the forces and thus prevent military clashes between th two Koreas"; compare Kim, Kwang-Tae. "After Exchange of Fire, N. Korea Threatens More Strikes on South," Archived 2010-11-26 at the Wayback Machine Time (US). November 23, 2010. ^ Pak, Hŭi-gwŏn. (2000). The Law of the Sea and Northeast Asia: a Challenge for Cooperation, , p. 108, at Google Books; excerpt, "Under the 1953 Armistice Agreement, the Military Demarcation Line was drawn across the Korean peninsula. Since no maritime demarcation line was specified in the Armistice Agreement, however, the United Nations Command drew the NLL...."
^ "Korean War History". Retrieved 2006-01-12. ^ "Factbox: What is the Korean Northern Limit Line?" Reuters (UK). November 23, 2010; retrieved 26 Nov 2010. ^ Kim Young-koo. "A Maritime Demarcation Dispute on the Yellow Sea: Republic of Korea," Journal of East Asia and International Law (JEAIL), Volume 2, Number 2. ^ "Modern meaning of Korea’s maritime line," The Hankyoreh (ROK). October 15, 2007. ^ In principle, the UNC and PRK could agree to extend the MDL into the Yellow Sea (IAW para. 62 of the KAA); however, there is no such agreement. ^ Zou, Keyuan. (2005). Law of the Sea in East Asia: Issues and Prospects, , p. 7, at Google Books; excerpt, "In response to the unilateral NLL, the North Korean authorities declared after the 1999 incident (on 2 September 1999), that they had set up a 'North Korean Military Demarcation Line in the West Sea (Yellow Sea)' which overlaps with the existing NLL"; Lee, Hy-Sang Lee. (2001). North Korea: a Strange Socialist Fortress, p. 191, p. 191, at Google Books; "South Korea is a criminal without principle." – Noth Korea [sic] Sri Lanka Guardian, November 25, 2010. ^ "NLL—Controversial Sea Border Between S.Korea, DPRK, " People's Daily (PRC), 2002-11-21; retrieved 2010-11-26. ^ Ryoo, p. 11; excerpt, "The NLL has served as an effective means of preventing military tension between North and South Korean military forces for 46 years. It serves as a practical demarcation line, which has contributed to the separation of forces." 1999 United Nations Command (Korea); Aigner, Erin and Haeoun Park. "Military Strike in the Waters Between North and South Korea," New York Times. November 23, 2010; Williams, David and Peter Simpson. "Korea on the brink: South warns of retaliation after North's shellfire strike kills two marines," Daily Mail (UK). November 24, 2010; retrieved 22 Dec 2010.